Wound measures approx. 2" x 4"
Did you hear that? It sounded like someone just screamed. Oh no, the zombies are coming! And, they have super long finger nails! We don't know if all zombies have long finger nails, or if they are just scary. But, with the Slashed Temporary 3D Tattoo Kit you can easily accessorize your bloody costume. Maybe you were attacked by a bear like Leo in that one movie, or are pretending to be a creep like Freddy from that other film. Believe it, or not, we are big film buffs here! We really love zombie movies! Application and removal instructions are included in the package, so your slashed scary look will only last however long you desire. 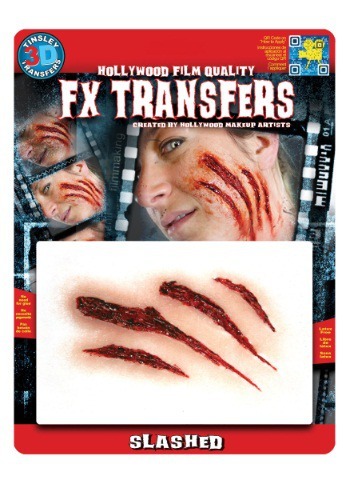 Get ready to have a blast at your next Halloween party as a zombie, or whatever creepy creation you come up with.